Perspectives on the interaction between people of different cultures has changed considerably over recent decades alongside significant changes in higher education worldwide as the policies of globalisation and internationalisation have become widespread and neoliberalism has become prevalent in higher education, characterised by economic imperatives and a trend towards standardised curricula and pedagogy. Responding to the call of Mullen et al. (Interchange 43:181–186, 2013) for a ‘re-centering of [the] field towards orienting leadership practice … around issues of pedagogy as opposed to those of management’ (p. 183), this chapter critically analyses the application of theoretical perspectives to the development and implementation of elements of an actual graduate leadership programme in a Middle Eastern tertiary institution. Using a Bourdieuian framework, it first provides a contextual overview of the nature of neoliberal policy enactments and their impact on teaching and learning in that higher education setting. 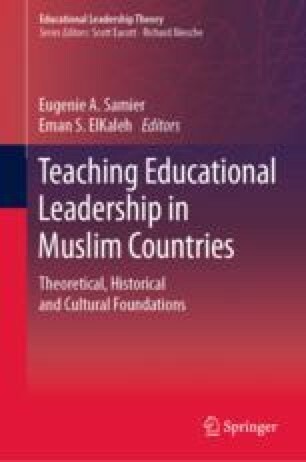 It then discusses how the authors developed and implemented courses within the leadership programme with Emirati students, drawing on content from Western and Arabic and Islamic research and based on a social-constructivist perspective and a Habermasian ‘communicative action’ standpoint where it was important for the students to engage in critical conversations and discussions to compare and contrast ideas and to adapt them to their own leadership context. Finally, the chapter reviews the successes and challenges of the graduate coursework drawing on theoretical views of cultural difference, intercultural education and communicative action, to examine the ‘fit’ between theory and pedagogical practice in leadership development. Andenoro, A. C., Allen, S. J., Haber‐Curran, P., Jenkins, D. M., Sowcik, M., Dugan, J. P., et al. (2013). National leadership education research agenda 2013–2018: Providing strategic direction for the field of leadership education. Available http://leadershipeducators.org/ResearchAgenda. Dubai Online. (n.d.). Available https://www.dubai-online.com/essential/united-arab-emirates/. Accessed November 11, 2018. Ministry of Education. (n.d.). Strategic Plan 2017–2021. Available https://government.ae/en/about-the-uae/strategies-initiatives-and-awards/federal-governments-strategies-and-plans/ministry-of-education-strategic-plan-2017-2021. Accessed August 29, 2018. Nazzal, N. (2001, October 22). Call for change in UAE education policy. Gulf News. https://gulfnews.com/news/uae/general/call-for-change-in-uae-education-policy-1.427929. Accessed August 29, 2018. Zaatari, S. (2017). Education vital for switch to knowledge-based economy. Gulf News, 10 January. http://gulfnews.com/news/uae/education/education-vital-for-switch-to-knowledge-based-economy-1.1959679. Accessed August 31, 2018.